The majority of the jasmine scenting will dissipate after the first steeping, but subsequent re-steeps will have a milder floral style. 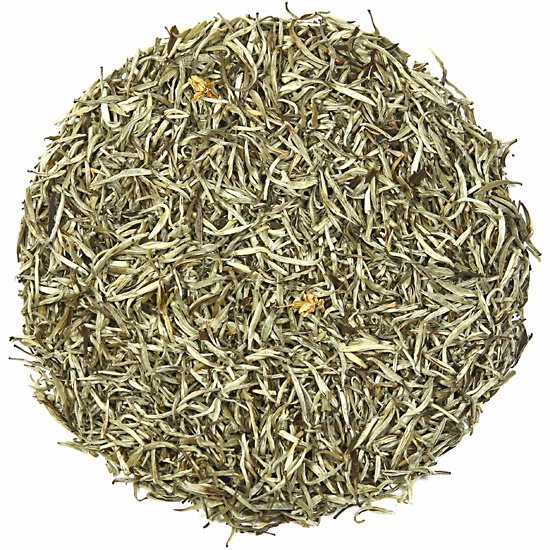 Jasmine Silver Needles is an all-bud, Jasmine blossom scented tea, manufactured using fully-manufactured white tea. While these buds have undergone the traditional Jasmine tea scenting, they have become ultimately a Jasmine tea that has a unique contemporary tea production methodology. We have selected and offered Jasmine teas made with many base leaf styles over the years, but we do find that Jasmine scenting to a white tea bud or leaf produces an extremely delicious finished tea due to the slight oxidation that white tea manufacture must have. The scenting of the base ‘leaf’ for this Jasmine Silver Needles tea is done in the traditional-style of eastern China. This requires that several layerings of fresh flowers are added to high quality buds until the entire batch is well-scented..
During Tea Trekker’s Jasmine Silver Needles tea preparation, the buds are allowed to wither slightly longer than most buds used for Silver Needles white tea – this gives the buds in Jasmine Silver Needles a beautiful silver-white color. 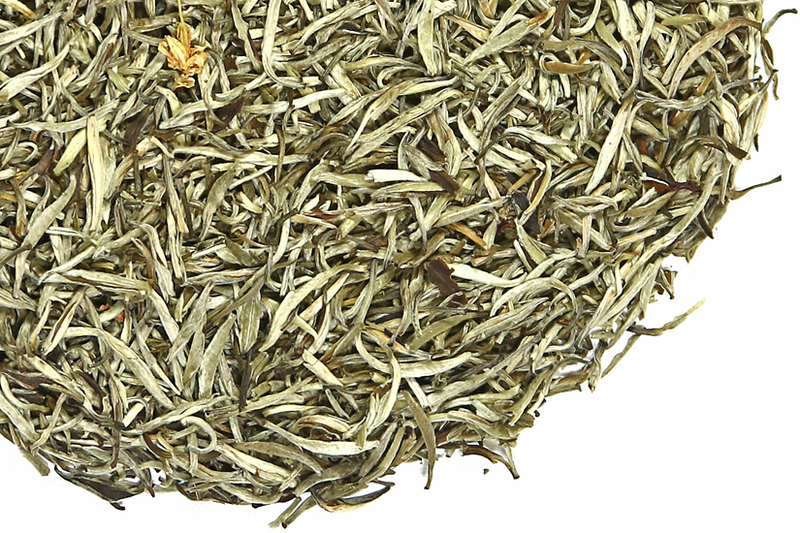 Tea Trekker Jasmine Silver Needles tea is for tea drinkers who like their Jasmine tea modestly-scented and with a good amount of mature tea flavor. If you are a white tea enthusiast or appreciate a subtly-scented tea, definitely give this tea a try. Because the majority of Chinese Jasmine tea drinkers prefer that the flowers are removed prior to being offered in the marketplace, our Jasmine Silver Needles has had its blossoms removed. It is generally not considered a positive to have blossoms in the teapot or cup – once they have done their job they are removed and the finished tea holds all the flavor locked inside its buds. The best Jasmine teas, such as those sold by Tea Trekker, are made using fresh Jasmine flowers that bloom from mid-July through September. Jasmine teas are seasonal teas and are ready for sale after October of the year in which they were made. Traditional Jasmine tea is scented using fresh flowers and not artificial perfumes or flavors. The tea is made from fresh tea leaf that is picked and semi-processed in the spring, and then put into storage until the Jasmine flowers bloom over the summer beginning in early July. Tea Trekker tends to prefer the varieties of Jasmine that bloom a little later in the season, as they have a purity of scent and are rich and smooth. When the fresh flower buds arrive in the tea factory, the semi-processed tea is taken out of storage and the tea and the blossoms are ‘married’ together with the fresh still-closed tea buds. As the blossoms open in the evening the scenting process begins. Depending on the quality (and selling price) of the Jasmine tea being made, the scenting process can take 24 hours or up to several weeks during which time the same batch of leaf is repeatedly introduced to fresh batches of Jasmine flowers. 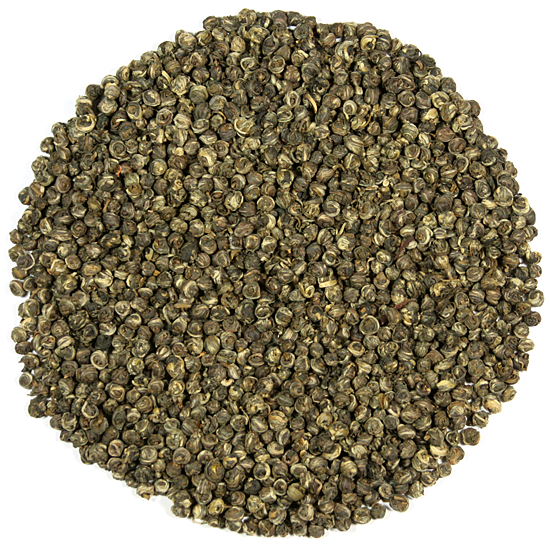 The semi-processed leaf for Jasmine tea is a unique tea base made for the production of Jasmine tea. It must be perfect in style and level of minimal oxidation. Because Jasmine tea production exposes the leaf to some heat during the processing, the base tea used for Jasmine is neither green, white, nor oolong tea, but a partially-finished leaf that is unique to Jasmine tea processing.